Rehoming my Macaw. He is only 11 months old, beautiful nature, loves cuddles, just starting to talk, he walks around house with my dogs, so he isn't phased with other animals only rehoming as new job will increase the hours I will be away from home. 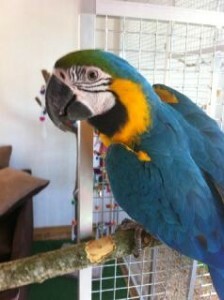 Will be rehomed with a cage, parrot stand and all his toys.